We start with the fabric "Zillions of Hearts" and create a square neck aline style dress. The dress has shoulder straps and a ruffle made of cream fabric embellished with red ric rac. 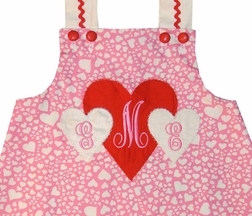 The cutest part are the 3 red hearts appliqued on the front of the dress. 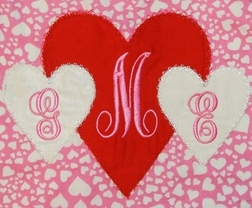 The hearts are monogrammed with your little girl's initials. 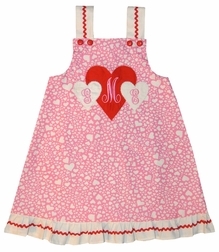 Hearts are universal so the dress can be worn in Spring and Summer long after Valentine's Day.